Living history reenactors will bring World War One to Governors Island National Monument on Saturday and Sunday, Sept. 15 and 16, 2018. This is the largest free public WWI exhibition in the United States. Reenactors representing the Allies and Central Powers—as well as civilians in 1918-era attire—are invited living history participants. Governors Island is in New York Harbor, accessible via ferry. 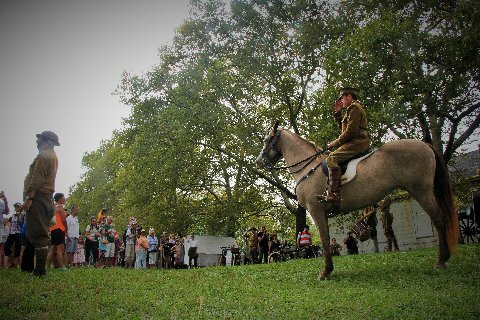 This is the third annual WWI event on Governors Island. The events are free, open to the public, and run 10:00 AM to 5:00 PM at Governors Island National Monument. The displays will be on the Parade Ground. Ferries run from Brooklyn and Manhattan. Ferry info here. If you are a WWI reenactor you are welcome to attend. We will bivouac overnight Saturday night, September 15. All participants must register in advance. Only living history participants are permitted to camp overnight, no exceptions. More details on sponsors, participants and supporting groups is forthcoming. Direct all questions to event organizer Kevin Fitzpatrick, program director for the WWI Centennial Committee for New York City. Contact here. Actor/Historian David Shuey provides the most accurate and compelling portrayal of General John Pershing. Audiences enjoy a unique experience. Shuey portrays General Pershing with his horse, Aura Lea. His first-person portrayal is lively, realistic, and interactive.